I am very glad to meet a second musician from the PSO. I’ll start by asking you how do you understand the expression “inner song”. Well, I don’t think I’ve heard it very much before, maybe a little bit…maybe it’s just the way you prefer to approach music, your own inner song, it wouldn’t have to be original, not your own composition necessarily, but the way the you prefer to express music, I guess. To express music when you play? Before playing? Well, good point, you won’t have control of what you are doing unless you’re thinking about it beforehand. It has to be before you make the sound, “I want to sound this way”. There is a “before playing?” The sounds doesn’t only result from playing your instrument? Yes. The concept is separate. And of course you’re trying to get as close to your idealized concept as you can. Idealized meaning perfect in your mind “I want to sound this way; I want to do this”. You have an image in your mind but it is aural. But it’s still an image. It’s before playing. How would you describe it? Aural. It is auditory. It would be how something is going to sound. So that would be in your mind, you know, in your memory of sounds. And you would try to make that and it would be different according to what piece or what passage you’re playing. If it is an inner sound, that supposes that you have an inner ear, how does it work? Do you grasp it through concentration, through singing it? All those things. I am thinking of when I am playing and trying to do justice to the music, to render the music as beautifully as possible. It depends on what you are playing. Sometimes it’s about the color of the sound: what kind of tone is appropriate for this passage, right now. You want to be thinking of that beforehand because it takes a lot of experience and skill to be able to get close to this inner image. Hopefully a good musician has some idea before he starts. It reminds me of the idea– when you start, it is almost like you want to already be there, before it happens, you want to be warm before you start, it is similar to that. You have it in your mind about where you want to be once you start to make a sound. It is something that gives you a direction? Is it a movement? Yes, it will be changing all the time depending on what passage you want to play. I also imagine that improvising musicians have some idea before they play—I mean, it is spontaneous what they do, but there is some idea of what, in a general way, where you want to go with the phrases. It seems to me that what you’re talking about is more what you are hearing in your mind right before you play something, what you are hearing in your mind’s eye. In English we say “in the mind’s eye”, in the eyes of your mind, meaning, a memory, you can look up into the side, you’re remembering something, you’re seeing something. So I am saying in you mind’s ear. I guess it is what I am saying. In the ear of your mind. You want to have a certain sound or attack or rhythm. It is in there. Before you do it. This inner song is therefore anticipation. To me it sounds that way. I understand. When I learned cello as an adult, my teacher used to ask me to think of the note before playing it. It is exactly that. It is almost like you are singing it in your mind to yourself, beforehand. It is sort of striving for the ideal. A lot of times, it is just about the sound, the intonation, the tone quality, the quality of the sound. Do you think there is also a mood? Maybe a little bit but it is more about, “how can I give the impression of this mood”, not so much that I am feeling that mood. You want to do what you can with whatever control you have over your music making, to give the impression of this mood, this atmosphere. For you, as you are not improvising, it is an image of a score. How do you get this image? Do you feel the score, or work on it intellectually? With the orchestra we have a repertoire of pieces, pieces we know, not everyone, but if it’s a brand new piece, maybe you don’t discover exactly how you want it to go until you’ve lived with it a little bit. You have to have several days of rehearsals. Especially in orchestra, it is more complicated because you don’t have the totality of the piece by yourself. I remember when I was playing in an orchestra, I got frustrated because I felt the lack of all the rest of the orchestra, the whole piece with all the instruments’ parts. If you are not too overwhelmed with just doing your own thing, in an orchestra, you can listen as the audience would listen. The best players in a large ensemble like that– if you play, like you’re playing, but from the conductor’s point of view or the audience’s point of view, then you are fitting your part into the larger context. The best player is the one who is able to enlarge his view to the ensemble? Yes. And they know at any one time what you are playing, when it is the most important, when it is the least important, when it is secondary,etc, the best players do that: they put the puzzle together for the conductor almost, so that there are just little things for the conductor to do. The conductor balances and guides you. Your own inner song has to adapt to the conductor’s idea. The best ensemble players are the ones who are already thinking about how all the different parts fit together, in the best combination. What should be heard, and what should be following, and what is just background atmosphere? The best musicians will already, without any instruction from the conductor, be helping to put it together in a very good, recognizable whole. A kind of awareness of the whole. Yes. The best ensemble players should be very aware ofwhere they fit in and where they don’t. Not only where but also when. Everyone has to know where the piece is going. Yes. Hopefully, what you decide to do with your own part is a good judgment of how important it is. Think not even like the conductor but almost like the composer. Yes. How many are you? Two, three or four. For winds it is usually a choir of eight or ten. And the bassoon section. And the wood-wind section. And then, you know, fitting into the whole orchestra. Then you are not only working in an orchestra but also playing for yourself. Is it the same work? Almost. You have to think about what is the most important part. But it is a lot easier to figure out what your rules are on a smaller scale. The approach of the piece of music wouldn’t be any different but you’re responsible for much more of it. And your ear is working in the same way? So it is interesting because you have a kind of double ear: one that listens to what you have inside you, and another that focuses on the surroundings. You are always commuting between the two. Yes. Eventually, after studying for a long enough, you sort of need to become your own teacher. So you have to be good at doing the playing and also having the one ear over across the room being the teacher listening to yourself. You need this double hearing. It is probably related in a way to the idea of anticipation. It is another kind of double hearing, not just the anticipation that we talked about before, where you do a sort of pre-hearing in your own mind, but it is more like when you are playing to be able to be honest with yourself and to have one ear being objective and removed in a way from what you are working–listening and playing—you’re trying to have a beautiful sound and whatever and the other ear is here there listening and thinking :” hm, that part went well but that next part wasn’t so good”. Yes. And hopefully in a good way. But honest with yourself. Do you think the sound is also transmitted through an inner voice? Something that allows one to express a resonance, a medium. Because when we play, in a way, we are singing what we want to produce. Singing has its own technical…I’ve heard two opinions on this idea of singing through an instrument. Almost everyone is trying to sound like a singer when they play. That would be the ideal. Some say that the string instruments, because they have the ‘boings’ they can help define the phrasing,so it is easier to play musically. And also if you blow into the wind instruments it is a little bit like singing because you use your mouth. All the instruments are connected to the voice. You have to sing to a certain level when you start music. Even if it doesn’t have to be great singing. Sight-reading is an example of this song, isn’t it? But in this situation, I think part of it is memory. It is a pitch memory. But you mean conceiving of the melody? Usually it’s from humming or singing, and not just from my mind. I could look at the score and not sing or hum, and I would be doing that in my mind. There is a certain amount of natural ability in being able to hear the notes but it also can be developed. The body participates in this, doesn’t it? I guess. Even if you have the same instrument, you could have one horn player playing something in one way, and another horn player doing it in a completely different way. There is definitely an individual, physical aspect. But sometimes that has to do only with the resonance of your body. Some of us wind players have noticed that if you’re a big person and have a big head…people are different sizes, different resonating. You might have similar things in your mind, but since the bodies are different, you probably have to go about getting your sound in a slightly different way. Your work also impacts it. A sound isn’t just something that happens to you, you have to model it. For me, it depends on my fingers, my cello, the bow. For us it would be different depending on how the shape or size of someone’s oral cavity is different, and also how fast they push the air through etc. There are some “schools,” families of sounds? Yes. It could be just “I want to sound a particular way,” and you do whatever it takes to sound more the way you like. The reed has a sound. Each piece of cane, it either vibrates well, or not. Mostly not. So we try to make the reed to be what is inside/to get the sound. You make the reed. 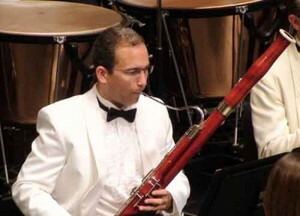 We all make all the bassoons. We get cane mainly from the Loire Valley but also from places where this cane, this type of grass, grows. It grows pretty much anywhere you have a vineyard. There’s cane from China, California, France. The French cane is better, in my experience. So we make them. That has a lot to do with how we want to sound. I mean, we chose. I make a lot of reeds but I don’t play all of them, because some of them don’t sound the way I want to sound. It’s a whole other wrinkle to that inner sound. You talk about schools of playing–with the double reeds instruments, the school of playing has a lot to do with the approach to reed making. They go together. On the East Coast of the USA it is more this way, on the West Coast, it’s a little more this way. You can copy your teacher’s way of making reeds and if you eventually find that it doesn’t work for you, you can make changes. I understand. Your own sound takes place, then in the context of your understanding of the phrase. How does it work for you? Usually this is how it goes: the wind players say that it is easier to phrase for string instruments—that’s the way it goes. If you are musical, you understand how to do that. What do you mean by “being musical”? Let’s put it in this way, maybe someone who has less of a feeling about how phrases go, even from the first time through, is less musical. As a teacher, how do you see it? Some students are more naturally musical. They play with a sense of line. And others might be better technically.. So they are two different things? Having a sense of line, and being a good technician? Yes. Now of course you need some technical ability to play with a sense of line, but you can tell when someone is playing that they have more of the feeling of singing a song. Do you think that, if you technique is not so good, the sense of line is also worse? Sure. But generally, for some people, when they play, you can tell that they have a sense of music as telling a story, they’re singing a song. Whereas for some people, it’s more playing the notes, in a way that’s correct, but not expressive. How do you help your students who play correctly but not expressively? I tell them: “you should listen to some of these great singers,” Schubert lieder by Dietrich fisher diskau, whoever you like. We say that for bassoon because it’s sort of the same register as tenor/baritone. You first advice would be to get more used to music. And emphasize the sostenuto. It is a line. Sustain your playing. Sing a song. The long notes should not die. Maintaining the tone thoroughout, not just phrasing away from things. It’s about keeping the energy. Yes. If you have a long note, you don’t want it to trail off, unless that’s how it’s supposed to be. I tell students, you’re holding the note for three beats, it sounds like you are waiting for the bus, you’re just standing there. Music has to be going somewhere. Not static. Motion. Forward motion. Whether it’s getting more active, or coming back from something. At least there’s no static. There’s very little in music that is static. Occasionally, if you’re playing an accompaniment, it may be softer. There is always a direction. You have to be involved in what you do, in what you’re playing. IT is also about putting yourself in what you’re playing. Exactly. Tell the story. Or at least imagine something. Music is a language. It has syntax, grammar. Say what you are trying to say very clearly. One of my concerns as a teacher–make sure that everything someone plays should be animated by some kind of intention. You want to show that you are saying something in a very particular way. You don’t just play it how it comes out. You should say your lines in the play as an actor would. You decide the best way to put the story across and you say it that way, very clearly. It has to do with a certain traditional orthodox interpretation of playing music. If you know the harmony, what is the most important harmonically, that will help you know what is the most important way to phrase. And that is what I mean by syntax or grammar. Composers wrote things with an idea. The harmony gets very interesting because the composer is saying : “this is the most interesting part of the phrase or the most dramatic part”, and you have to be able to show that. There is a syntax. There should be a clarity to the idea, “This is the most important part,”to this phrase, for instance. You try to understand what the composer is saying to you. I think so. And also even if the composer didn’t intend it, the music intends it, because of the harmony. You can even see more than the composer was conveying because you see it from a different point of view. Because you understand it in a different way. I wouldn’t say that I understand it more than the composer. Yes. But you can understand it in a different way, because you’re not him, you’re not the composer. You have to be so clear concerning musical intention. How are you saying your lines on stage? It has to be specific. I was at your concert last Friday. I know the Dvorack concerto very well, but this time, I had the sense that the balance of the orchestra was extremely good. It was very cohesive. It was really clear what all of you had to do. I like that conductor a lot. Juraj Valcuha is very musical. Wagner especially was so wonderful. Yes. True. It is very difficult to play that piece well. And I am not a big fan of Wagner. But it was beautiful. In this case the conductor knew how to get the parts to fit together the right way, he knew what was the most important at every given moment. And he sort of sculpted this out. He knew where everyone ought to be. Very small differences mean a lot. How do you decide if the conductor is good? They have to hear well, they have to know the music well enough to know what is really, they have to communicate well with their hands. It is hard to be a really good conductor. There is an intangible thing about conductors, sometimes people just respond well to someone and you don’t really know why. There’s some positive energy that they bring. Some of them of course bring quite negative energy, and we respond badly, even if they’re really, highly skilled. Last Friday, during the performance, he was relatively low-key, he didn’t move a lot, it was a sort of a quiet intensity, but that is so much better! Very serious about the work, very energetic, but not overt. He is good, I think he has a bright future. Do you have unity because you are an orchestra, or is he the one who creates unity? We have to try to listen to each other, be very sensitive, build the unity, but he is helping us to be even more unified because you know, we are such a big group that we need something more. No one can be that sensitive with such a big group, you need a little help from someone in front. But you don’t need everything—you just need some help. If it’s a good group, and we have a pretty good group. Can you evaluate the balance from where you are? It is hard to know sometimes. I mean, if you sit where I sit, you think the balance is bad, and out in the hall it is good, so that’s another reason to have a conductor. They get the whole picture better than I can. I am right in the middle. Sometimes, people behind me are very loud, and I can’t hear the violins, but in the hall, you can hear that, so you have to trust the conductor to balance. And how do you prepare a piece at home? You know, some people are doing a lot of listening but I am not. I like to discover myself by playing it with the orchestra. I like to discover rather than be prepared for what I will hear. I practice my part, I make sure that I know it, but I like to discover. Yes. But you are not playing all the time; you have to know exactly when it is your turn. Sure! But you read the score. I don’t memorize it in that way. I just read. We play a different program every week, sometimes we already know the piece, sometimes not. Your culture helps too. Do you have a musical family? Yes. My father played principal horn for 35 years in the Saint Louis Symphony and he is now teaching at a conservatory and my mother is a violist, retired now, she was in a string quartet for many years. But they didn’t press music on us at all. It was our own choice. But there was music at home. Yes. People practicing. It was part of the world. It wasn’t unusual. It is interesting because there are a few people I met who had no contact with music at home. I know. Sometimes it jumps a generation but there is often music around. You have to have this surrounding, which helps you. Probably. I listened to a lot of jazz when I was a teen. I like that a lot. I started playing saxophone, I played saxophone in college to. I liked to listen to a lot of different things. I listened to rock and roll, jazz, everything. But you have to go where your talents are, and I think my talents were with a bassoon. Going where your talents are. I like this idea. I will finish by this and thank you so much to have shared your experience for my research. See you with Zach next Friday ! © 2013-2019 Ellen Moysan / Phénoménologie du chant intérieur. Reproduction interdite sans autorisation préalable.